Every cello has a wolf note, although the strength and offensiveness may vary a lot. The wolf note is almost always between D and G - usually around F, and generally appears at its worst on the note played in 4th position on the G string. A wolf note is caused by a conflict between a strong resonance in the cello body and the note being played, which leads to an oscillation or howling or out of tune note around the body resonance frequency. 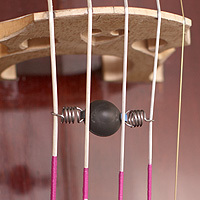 There are essentially 2 common approaches to reducing the effect, one is to decouple the string from the body by stiffening the bridge, and the other is to absorb some of the offending resonance with a resonator of the same frequency. 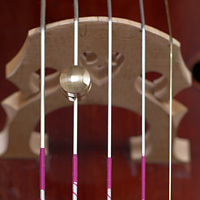 Traditional (rubber lined brass pipe) wolf eliminators work primarily on the first principle, stiffening the bridge response, essentially like a mute. Unfortunately this usually reduces the harmonic richness and lively response of the cello across its whole range, a big price to pay to fix one problem note! In recent years various new and much improved designs have appeared, here are some of them. Since every cello and every setup is different and requires different solutions to remove wolf notes, you can buy a selection of products and use our 10 day trial period to discover what works for you before returning any items that turn out not to be needed. 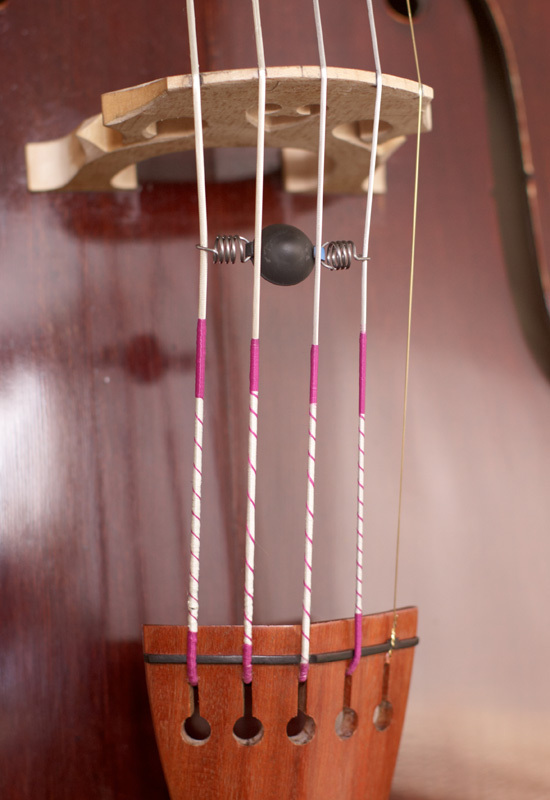 The lup-x eliminator is the best we have seen of the type that adds mass to the string between the bridge and tailpiece. It only contacts the string at one point, and contains no rubber to absorb high frequency vibration. 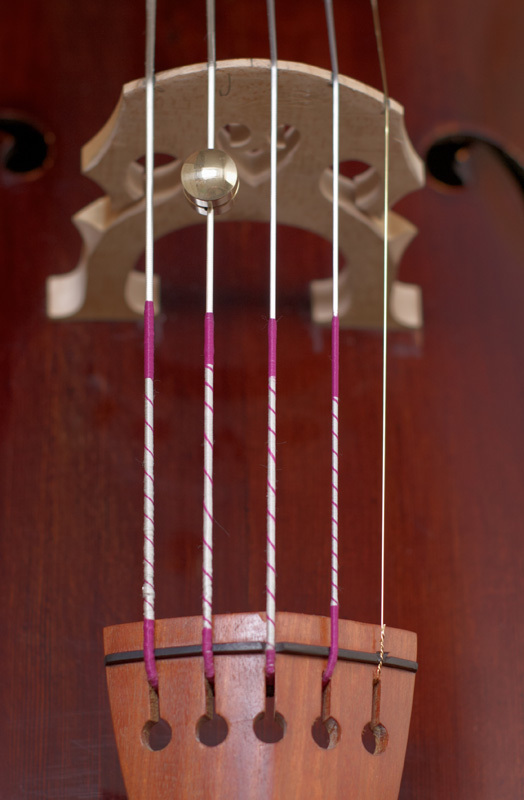 It works using both the above-mentioned principles, the added mass both tunes the piece of string to absorb unwanted resonances, and slightly stiffens the bridge at certain frequencies. It has the smallest muting effect possible for an added-mass-on-the-string type eliminator. Available in two weights: 8 grams and 5.5 grams. In stock now. Basic shipping rate is added to your cart automatically to cover UK delivery. Please add international postage for overseas shipping. The Güth eliminator works entirely on the frequency absorbtion principle, it does not weigh down the bridge so it has very little muting effect, even less than the lup-x. Since it is a tuned absorber, you need to specify which note is your wolf note when ordering! Available in D-E (low) Eb-F(med) and E-F#(high). In stock. Weight approx 5 grams. Basic shipping rate is added to your cart automatically for UK delivery. Please add international postage for overseas shipping.